I can not believe we are already halfway through August. Where the heck did the summer go? Work has been a tad bit crazy with the unexpected departure of friend and Program Manager, Tiffany. The majority of the work drops onto my lap, so I'm trying to figure out a way to juggle, basically, two positions without going completely insane. The ankle is doing better, but I still am not 100% to run on it yet. Certainly a detriment to triathlon training, but the flip side is that I've been spending a lot more time in the saddle...and I really think that will help in Tahoe. From what I hear, the bike course is not nearly as technical as the stuff here in the East, but has some INSANELY long climbs. Time to keep building the engine! On the racing front, the Cranky Monkey Series is back in full swing! The first two races, both at Wakefield, were a nice change up to the tri-specific races or the short Wednesday at Wakefield series. 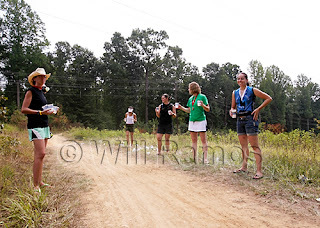 All I can say about this race is thank goodness it was not as hot as last year! Still a bit steamy at 85 degrees...it was a far cry from the 90+ heat we had in '06 for this series. Overall a good race and an extremely strong field of women sport riders. Placed in the top half with a 7th spot finish, but felt as though I should have been able to go harder and faster. My biggest struggle right now is finding the balance between my road strength and becoming more confident with the technical sections. Practice, practice, practice....or so the saying goes. But no crashes and the berms successfully completed on all three laps! Another warm day for this, my favorite EX2 mountain bike race...the Dirt Crit. The format of this race is simple: you have 45 minutes to complete as many laps on the 1.5 mile course that you can. Sounds easy, right? It's a full 45 minutes of red-lining, hard effort, and fighting for your place in the pack. Even if that means the rider isn't even in your class! 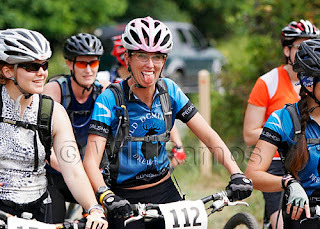 I was able to get off to a great start at this race and sit behind my friend, Liza, in 5th for 3 laps. 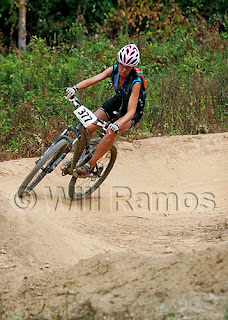 Halfway through the 4th lap, Liza let me pass her and I felt the best I'd ever felt in a MTB race so far this season. I was climbing the powerlines strong and holding my own coming down the berms. 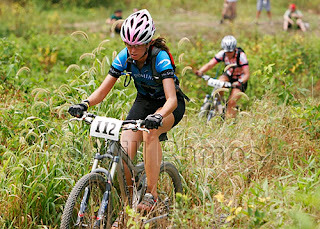 The other women in my class were riding strong, too, though....so it was all I could do to stay steady and hold my place. Coming into the 5th and final lap, I started up the powerline climbs for the last time. By this time in the day, the hills were very sandy, dry and gutted...and the line was really only clean enough for one rider, unless both riders were actively trying to keep the pass safe. Still in 4th and stoked for my first Ex2 podium of the season, I feel a rider coming up on my left. Without warning, he tries to pass me just before the crest of the second powerline hill and, for whatever reason (bad positioning, bad line, fear of biffing or just plan aggressiveness), he leans to his right and sticks his shoulder into me. (see photo!) 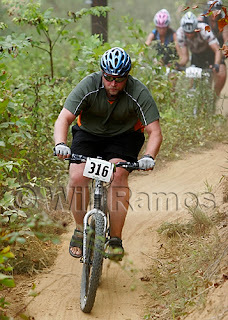 Caught off guard and still trying to hold my line, my back wheel slips in the sand and I go down. The rider keeps going, along with Liza (then in 5th), and I lose 20 seconds regrouping and getting back on my bike. 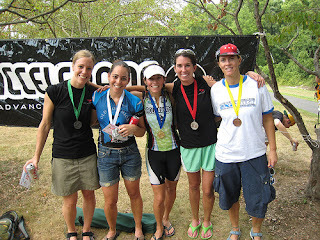 I finish just behind Liza, still make the podium, and feel lucky that I didn't re-injure my ankle in the fall. I just hope that Sport rider felt satisfied with his 13th place finish!